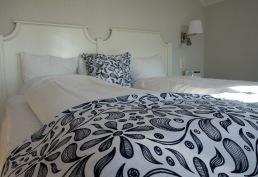 Our rooms are individually decorated in a brigth, romantic style. All rooms have a very high standard of furniture and materials and the rooms are silent and have top-notch ventilation and fire protection. 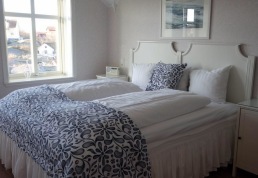 All rooms have a comfortable double bed and a fully tilet bathroom with floor-heating. 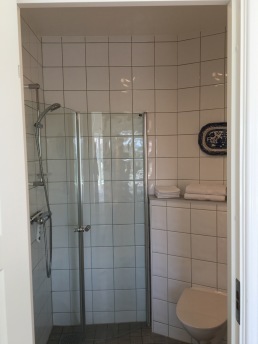 We have removed the TVs from the rooms as we believe you want to spend your time at Käringön without watching TV. Our reception is open 24/7. Discounts for longer stays - please contact us! 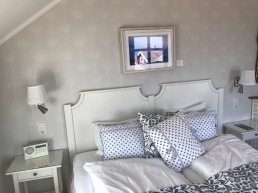 Signe has romantic wallpapers with roses, is located on the ground floor and is the room closest to the sea. 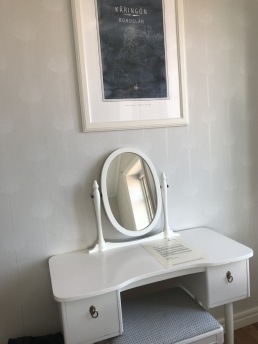 The room is suitable for handicapped guests. 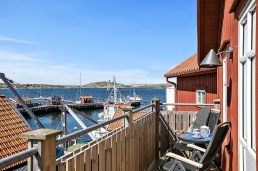 Greta is located on the first floow and has a lovely balcony towards west with a nice view of the small habour and the sunset. Olga is the brigthest room in the house. It is located on the first floor and has a lovely view towards south and our own dock just below. Aurora is the goddess of dawn, The room is our smallest room and located on the first floor. 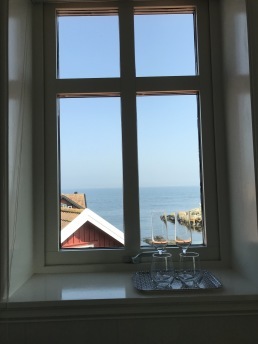 It is also the room with the best view. You can lie in your bed and see the sun rise above the Käringö fjord. Elin is our minisuite on the first floor, with a magnificent view of the harbour. The room has a wooden sofa that can be used as an extra bed for a child. Astrid is located on the ground floor. The room has a large balcony towards west where you can enjoy the view of the harbour in the evening sun.